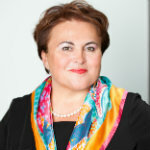 Virginia Oțel is a senior executive with more then 20 years experience in the financial sector in Romania, with expertise in general management, business development, marketing, corporate communication, human resource management. She has served in management boards and board of directors of financial institutions she worked for. She has participated in many national and international conferences and seminars as speaker and panelist. Ms. Otel has been working since the end of 2006 within Garanti Group Romania, currently holding the positions of Deputy General Manager of Garanti Leasing and Communication Leader of Garanti Group Romania. Ms. Otel graduated the Executive MBA with the Romanian-American Postgraduate School of Business in cooperation with the University of Washington, USA, in 1999. In 2013, she attended the Aspen Seminar for Leaders and became a Fellow of Aspen Institute Romania. In 2011, Virginia joined PWN Romania, involved in the “Mentorship” and “Women on Boards” pillars developed by the association. She was elected Vice President “Women on Boards” of PWN Romania in April 2014 and in April 2016, she was elected President of PWN Romania. Since February 2013, she has become a member of the Romanian Business Leaders Foundation, currently being the Co-Leader of the “Mentoria” project, dedicated to business mentoring of young entrepreneurs.